Can't say enough about this comforter. I washed it as soon as I unpacked because it had a strong odor. It came out beautiful and feels like butter. I would buy this again. Revive the look of your bedroom decor with this Echelon Home duvet cover set. Crafted from 100-percent, Belgian flax linen, the pre-washed set features one duvet cover with button closure, and two pillow shams, available in a variety of soothing colors. Designed for durability and comfort, the chic set becomes softer with regular use and washing. I'm so glad I ordered this set. I was hesitant since previous reviewers stated it was thin. I love that it's not too heavy and has a lovely drape. I ordered the king in stone color, it is a light tan color, almost flaxen. The drape comes down about five inches on each side of the bed, which my IKEA duvet did not. I washed the set and it has a perfect amount of rumpled linen " worn in" look, without being too wrinkly. The pillow shams have a two inch free edge all the way around for a finished look. Im very happy with the purchase, it's very similar to one I saw in a store for triple the price. Better than Anthro, Pottery Barn, West Elm, etc. ! This bedding is by far my new favorite. The quality and look if the Belgian Washed Linen is absolutely amazing. It's comparable - if not better - to similar Linen bedding you find at Anthropologie, Pottery Barn, West Elm etc. - and it's at least half the price!! I'm always very particular about my bedding and look for high quality pieces, so I was hesitant to purchase this at first but I'm so glad I did! I usually buy overpriced expensive duvet covers, like the Georgina bedding from anthro (almost $400 reg. price!) - which is beautiful but extremely heavy and not comfortable at all. This is lightweight and the linen is soft. Will definitely be purchasing another set in a different color! This is a very durable duvet. I have washed it periodically for over a year, and it kept its color and remains in good condition. I bought the king size and inserted a 2 inch thick insert. 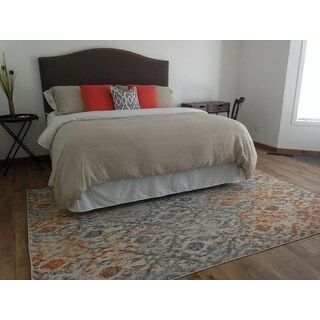 It did not cover a king bed then and left about 4 inches short on width and length. Order a larger size if you want it to cover your bed. I ended up putting it on a queen bed. I love the look of washed linen and often sew home decor items with it. I was about to order the 12 yards of linen needed to make a king size duvet cover when I came across the Echelon Home duvet cover set. The price is exceptional as is the quality. I ordered the king set in silver gray and could not be more satisfied with my purchase. In some natural light, the color has a bit of a blue tone to it, but it is beautiful nonetheless. The quality of the linen is excellent as is the finishing, with buttons on the closure and corner tabs to tie secure the comforter in place. The shams are generous in size and all pieces wash and dry beautifully, with no miscellaneous threads hanging out. I've washed the cover three times now and it is getting softer with each wash. 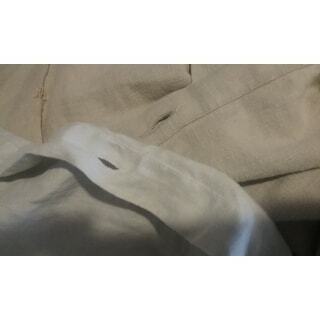 This is an exceptional bargain for 100% linen -- less expensive than some linen/cotton blends. Highly recommend. So soft and luxurious. This duvet cover was this finishing touch on my "grown-up bed" makeover. We had new linen sheets and a fluffy, perfect duvet--but after sleeping with the duvet cover added last night, my partner and I CANNOT shut up about how wonderful our bed felt. It felt like a totally different bed, like an expensive hotel bed. We slept sooo well. Because of a duvet cover? I don't get it either. I just wish I'd done this sooner! To soften, I washed the cover on cold and tumbled dry on delicate before putting it on the duvet. It's already super-soft. If it gets any softer after additional washings, getting out of bed is going to be impossible. I had to knee my partner out of bed this morning because he was going to be late for work because of this duvet cover; I called my sister and my parents to tell them about our "hotel bed". I wasn't exaggerating when I said we couldn't shut up about it. I bought a king-sized set for our queen-sized bed based on dimensions of our bed (pillowtop + memory foam mattress topper) and other reviews). I chose the dark grey (charcoal), and it looks just as pictured; really calming addition to light/neutral-toned bedroom. Added bonus: while WE love the texture of the cover, our cats hate it! Which is ideal, because they don't make biscuits on it--&gt;no tears or ripped fabric from kitten fingernails. Of course, I've had this thing one day, washed it once, I have no idea how it'll hold up. So far I love it! Would definitely recommend. Photo doesn't do a justice! 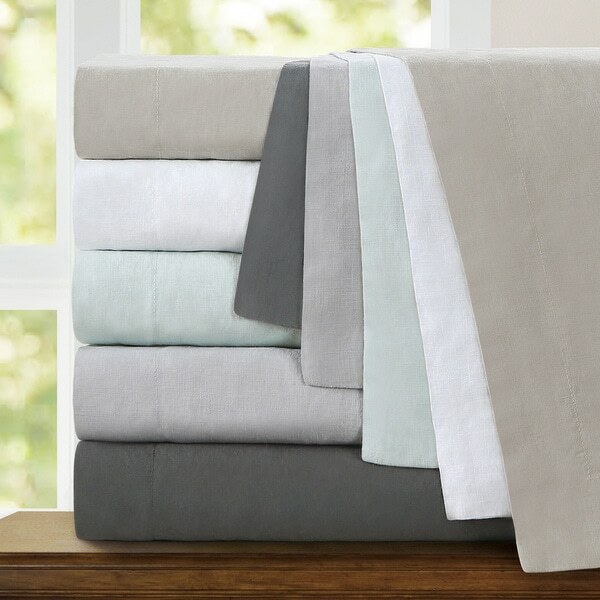 After comparing these to belgian linen duvets at a couple of high end stores, I finally purchased and am SO glad I did! They are very comparable and such a better price! They are GORGEOUS, the photos don't do a justice. I was a little worried as to what the color would be (I ordered slate), and it was perfect. It's definitely a little deeper shade of gray on the warm side. If you have cool grays, it won't work. Not do warm that it looks reddish though. I've washed it a couple of times and it keeps getting softer and softer and is so comfortable! I also love the shams with the inch of edging... so cute! My only complaint is that I'm a fan of duvets that have the invisible zippers and this has buttons that do show. Not a big deal on our bed, but just a note. The length was also fine on our king size bed! Would definitely buy these again! I gave this 5 stars considering the price/value of the King duvet set, and quality of the product. So soft, and beautiful colors- I purchased silver grey, and stone. The only issue for me is that the inside of the duvet cover doesn't have tie strings to attach to my duvet so it doesn't move around. Other than that, I love it and m husband does too. Great purchase. I ordered this to replace a linen duvet I bought from Costco several years ago, and am astonished by the absurdly bad quality of this new one. 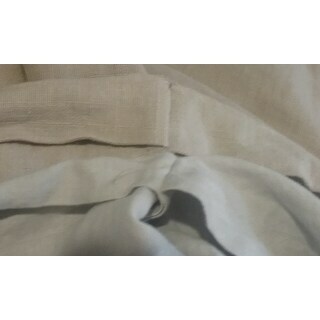 It is a very light linen, thinner than my lightest linen pants. It is see-through even in a poorly lit room. And that's just the fabric. 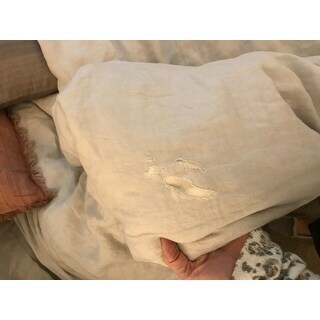 The seam on the pillow sham is incorrectly stitched on a crookedly folded edge. There's only one seam as well, and it's just loosely serged. It's labeled a full/queen but is much too small for the queen comforter. The edges don't even reach the bottom of the mattress. This is BY FAR the worst product I have ever purchased on Overstock. The photos I've included show the new duvet below the old duvet for comparison. *Edit--If you are still considering this item, it fits a "full/queen" size comforter from IKEA, which is smaller than a normal queen, I do believe. You can also avoid some shrinkage by ignoring the instructions and hanging it to dry rather than putting it in the dryer. I am still using this duvet, as I have not found a good replacement, but will move it to a seldom used guest room when I do. Negative: there are no ties or loops to secure the duvet to the corners of the duvet cover. Aside from that, I am very happy with the product. 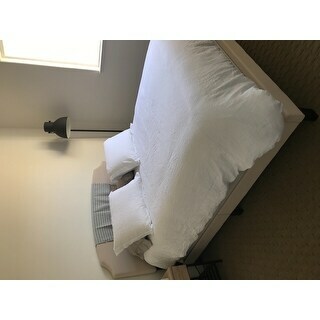 I washed the duvet cover before using it, and it immediately became softer, and the wrinkles relaxed (the dryer screen was thick with lint, but it was apparent that I would not have to worry about ironing the cover in order to have a company-acceptable look). Time will tell, but I expect it to wear well, as seams are overcast or in enclosed hems. I did stitch lengths of thin ribbon to the inside corners, in order to secure the corner loops on my comforter to the cover. I have rated the product 4 stars rather than 5 stars because, for the price of the cover, it should have a means of securing the duvet cover to the duvet. I purchased the seafoam color, which is very pale and soft in color, and slightly more green that blue. It is a beautiful color. Stone Color looks like photo. Soft linen, washed well, perfect size for king bed and covers insert perfect. Does wrinkle a bit but to be expected with linen. I spent a lot of time researching various linen sets but couldn't bring myself to spend hundreds for a name brand set. After reading so many positive reviews I purchased this set on Overstock for a totally reasonable price. I washed it twice before putting on my bed and as other reviewers mentioned, my lint trap was full. However, it feels really soft and looks beautiful. I'm really happy with this purchase. This set rivals the famous retailers who are known for their Belgian linen finishes and bedding. Absolutely luxurious and heavy and wash EXTREMELY well!! Best value for the money and clean edges are extremely high end!! I have Eileen Fisher linens on the bed in the master bedroom so I was preparing myself for disappointment when I ordered this duvet. It’s hard to buy these kinds of items online so I crossed my fingers and went with the reviews. I’m so glad I did because I have not a single complaint. I love the bright white and my oversized down comforter fit in it just fine. I’m thinking about getting another one. Exactly what I was expecting and better! I love linen and I thought that when I took the duvet out of the box it would be to crisp, but to my surprise they were soft and gorgeous! Buying another color. I've had this duvet cover for about 3 months and several holes have appeared - you'd almost thing I had moths (but I don't). Excellent !!! Easy to wash and dry! Very soft and comfortable! Love neutral colors available for this set. Great purchase! Beautiful linen look and feel. Smelled a bit funky right out of the package but washed up just fine and the smell was gone. Love this! A little thin, will be great for summer! Beautiful silver grey, absolutely lovely product. It runs a little big. I usually buy linen bedding from restoration hardware because of the quality but decided to try this. It is a thinner linen but very beautiful and luxurious. It did not disappoint! Love the washed linen look. Got the duvet in grey. Rough at first, but has soften with each wash. Has faded some from the sun. But for the price it’s a good deal. Great quality! They were soft right out of the package. Easily comparable to linen sheets. "How is this Belgian flax linen if the country of origin is China?" "Is the seafoam more blue or more green?" This seafoam is a light shade and definitely more of a pale green. I am not a fan of green but I think this color is actually very pretty it looks a lot like the picture. Hope this helps. I jumped and answered my own question by ordering the seafoam duvet. FYI, it is slightly more green than blue, but only barely. It goes very well in my blue seafoam room. It is a soft, lovely color, which faded to slightly more blue after the first washing. "Is the stone color more tan than grey?" I would say it is more grey. "This particular duvet set comes with a duvet, and 2 pillow shams. (What is the GSM? 170 or 200, or??) Also, are there sheet sets that match duvet sets (Color/patter, etc?) I find it difficult to find separate sets that have the same colour shades." Hello, The matching sheet sets can be found under ITEM# 18412761 (Echelon Home Washed Belgian Linen Deep Pocket Sheet Set ). Standard cases are also available under ITEM# 18412760 (Echelon Home Washed Belgian Linen Pillowcases (Set of 2)). "Do you sell a dust ruffle to cover the box spring mattress, that matches the duvet cover in egg shell?" "I'm new to the duvet have always done comforters, I see duvet covers but where do you purchase the duvet itself?" For no good reason, a duvet cover encases a: 1. quilt 2. comforter, or 3. a "filled" blanket Literally, a duvet originally meant a down filled comforter, which we now call a down filled comforter. In the recent past, a coverlet, or bedspread, would lay on top of a quilt/comforter/blanket/duvet and could be exchanged with lighter or heavier coverlets depending on the temperature. Duvet covers are meant to be used longer term possibly thanks to central heating. Ask your local linguist; it's all fun and you'll find plenty of options at Overstock. "Is the white duvet in the picture the eggshell white or bright white?" Hello, The white duvet cover set in the photo is eggshell white. We do not offer the duvet cover set in a bright white color. I would not consider it eggshell but because of the white and texture it doesn't come across as "bright". It is a true white, but soft. Think of a filter on a camera lens that softens the colors. It looks pretty white to me...maybe not harsh, glacier white, but a very pretty and soft white, no hint of yellow.